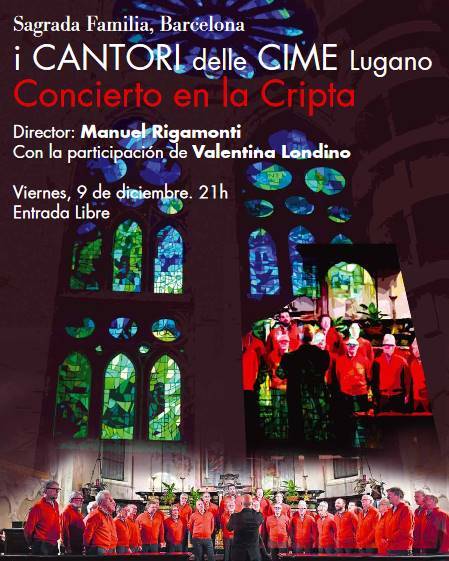 The I CANTORI DELLE CIME choir in Lugano, founded in 1969 and formed by about forty male voices, offers a free concert in the crypt of the Sagrada Familia next Friday, December 9. Its directors were Alfio Inselmini (1969-1990) and Gabriele Brazzola (1990-2008). From 2008 the choir is directed by Manuel Rigamonti. The repertoire is in continuous evolution and consists of some songs of authors, songs of the Italian choral tradition, popular songs adapted by the choir directors, own texts and local poets, with music by Manuel Rigamonti.